In colonial Princeton, Presbyterians had to travel to either Lawrenceville or Kingston to worship. After the College of New Jersey (now Princeton University) moved to Princeton in 1756, regular worship services were held in the Prayer Room of the newly-constructed Nassau Hall. A few years later an agreement was reached with the college for the construction of a church building. 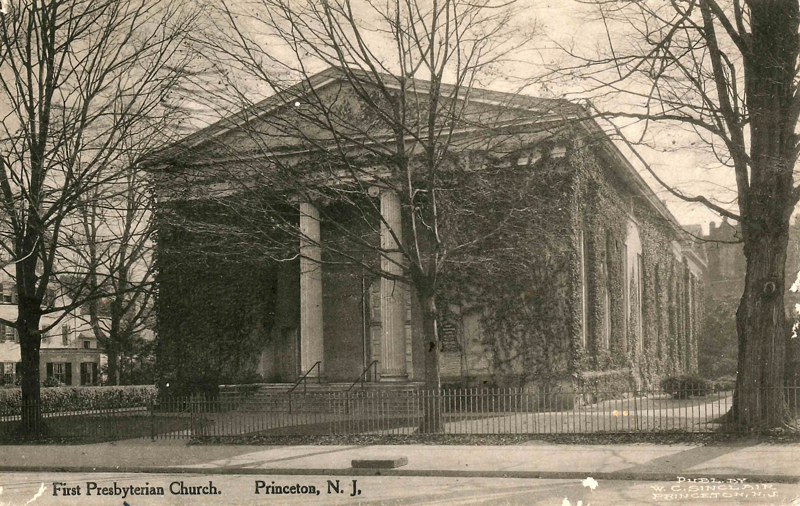 The First Presbyterian Church of Princeton was founded in 1766 and met on the site where worship continues today. John Witherspoon, President of the College, began 25 years of serving also as pastor of First Church in 1768. The church building was occupied by both British and American soldiers during the Revolution. The pews and galleries were stripped for firewood and burned in a makeshift fireplace inside the sanctuary. After the war, the devastated building was restored and services resumed in 1784. The original building burned to the ground in 1813 when a sexton accidentally stored live coals in a closet. It was rebuilt in eight months, but that building was destroyed by fire in 1835 when a skyrocket fired in celebration of Independence Day landed on the roof. The Second Presbyterian Church was founded in 1847 by eleven members of First Church. Its formation was in response to the need for increased church accommodations as well as the desire for more informal worship. The initial discussions about forming a second church started in 1832. The chartering of Second Church came years later after some lively disagreements about pastoral leadership and worship style. The first sanctuary is now an office building at 190 Nassau Street. Second Church soon outgrew the space in that building and constructed a new sanctuary at the corner of Nassau and Chambers that was dedicated in 1868. In 1972, both First and St. Andrew’s were without senior ministers. Each had begun the search process. In early 1973, the Session of First proposed the constitution of a new church, dissolving the existing charters. Witherspoon Street Church declined an invitation to participate in the merger discussions. A Joint Committee on Merger was formed and in less than 100 days a new church was established by an overwhelming vote of the members at First and St. Andrew’s. The initial congregation had 2,335 members with 1,759 and 576 coming from First and St. Andrew’s, respectively. On June 24, 1973, a moving Service of Constitution was held in Alexander Hall to formalize the beginning of the Nassau Presbyterian Church. Dr. Wallace M. Alston, Jr., was called to be the first pastor in March, 1974. For several years, worship and education activities were held in both buildings. The Chambers Street building was sold to the Nassau Christian Center in 1978. The proceeds were used to establish the St. Andrew’s Mission Fund, dedicated to provide income for “basic human needs.” In 1987-88, there was a renovation of the entire Palmer Square building and the addition of the office wing. Dr. Alston left Nassau in 1996 to become Director of the Center of Theological Inquiry in Princeton. Dr. Clarence Ammons served as interim pastor for four years until the Rev. David A. Davis was called in May, 2000. By God’s grace we step into the future of Nassau Presbyterian Church. We are mindful of a diverse past that now includes four distinct congregations. We strive to honestly wrestle with and celebrate our history while confidently moving forward into God’s future.